Charlotte Dowding in The Taming of the Shrew. Images Adam Trigg. The grass was a verdant green, the bunting was up and the acts were late arriving. Full marks to the Lazarus Theatre Company for injecting a summery festival feel into Shakespeare’s problem play, The Taming of the Shrew, which opened last night at the Jack Studio Theatre in South East London. Sara Reimers’ buoyant, 90-minute adaptation of Shrew, a play long criticised for its misogyny, gives you plenty to think about. 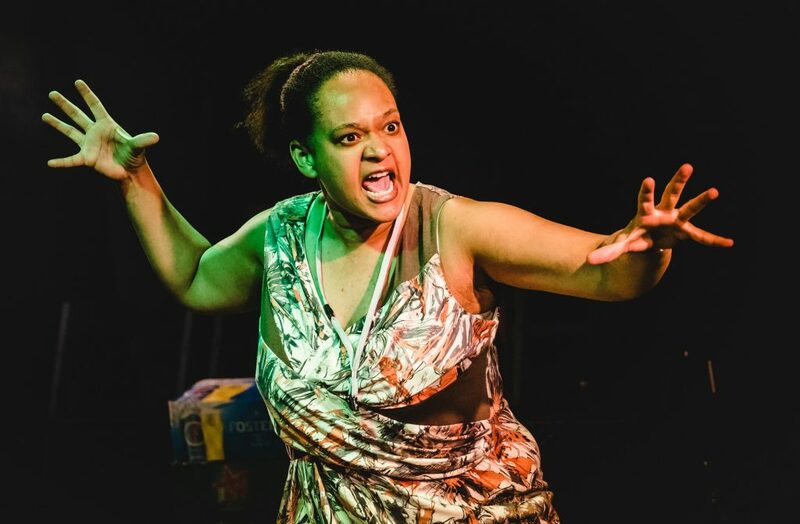 I’d always considered it a horrid little play, that espouses the worst possible excesses of abuse towards women, and so I was delighted at her rebellious denouement and Charlotte Dowding’s feisty portrayal of the Shrew, Kate. More than that, this production makes you question and rethink your views on it with the satire being brought out and its female characters displaying more strengths than I had ever given them credit for. It was refreshing to see that, rather than being crushed by Petruchio’s appalling behaviour and psychological abuse, Kate actually outwits hims and retains her independence. Hurrah. The production emphasises the framing device used by Shakespeare in writing the play, something which I’ve rarely seen incorporated in recent years. But the tragi-comedy wears an entirely different persona with its inclusion. It makes it far more credible to accept that this is now a morality play to perhaps caution Christopher Sly on his behaviour with both his girlfriend and women in general. We first meet the drunken Sly when he and his girlfriend arrive in for the show. Some audience members are being encouraged to perform their party tricks as part of the warm-up. He decides to impress by telling a few gags which turn out to be atrociously sexist. They embarrass his girlfriend, who is there to play “Katherina the Cursed” in the performance, and they don’t endear him to the women in the audience at all. 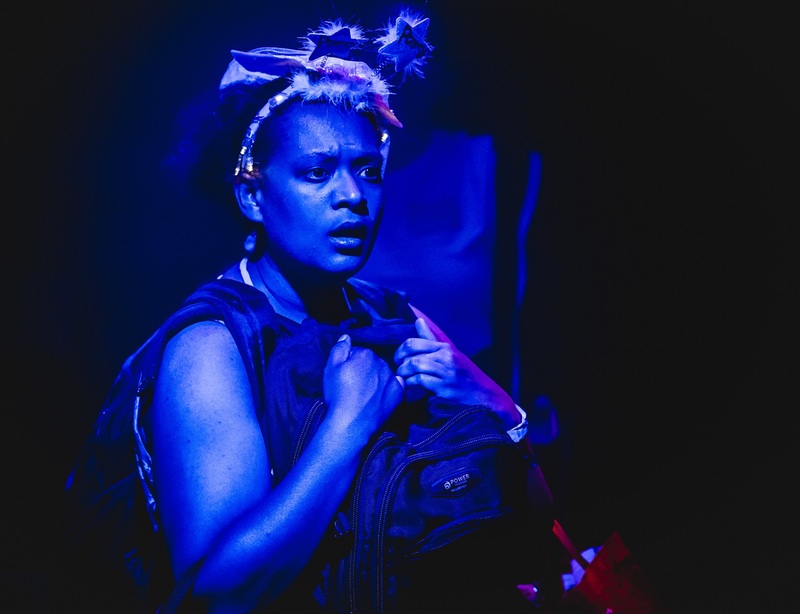 Unfortunately this leaves Gareth Balai’s Sly with little to do throughout but join us as part of the audience, which must be frustrating for the young actor. The performance is staged at an outdoor festival, hence the bunting, hippyish make-up on the players, and the encouragement for the audience to occasionally take part (don’t worry, as audience participation goes, it’s pretty tame). 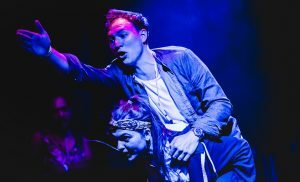 Mathew Foster’s confident, arrogant and overbearing Petruchio is on the lookout for a wife and doesn’t care much who it is so long as she comes with a hefty dowry. Which is why he accepts the challenge to marry the woman with the foulest temper in Padua so that a group of men can then fight it out among themselves for the hand of Kate’s lovely younger sister, Bianca. In order to get his prize he fights like with like and a verbal parry with Kate is smoothly performed by the actors. At their wedding Kate is appalled by her groom’s boorish behaviour and his sense of entitlement, which, as we all know, goes into overdrive on the “honeymoon” when he starves his new wife and plays a variety of tricks on her to get her to break. How wonderful to then see that, while she may give the impression of buckling under the pressure, there is a look of fierce dignity and resilience in her eyes. It’s a tremendous performance from Dowding. 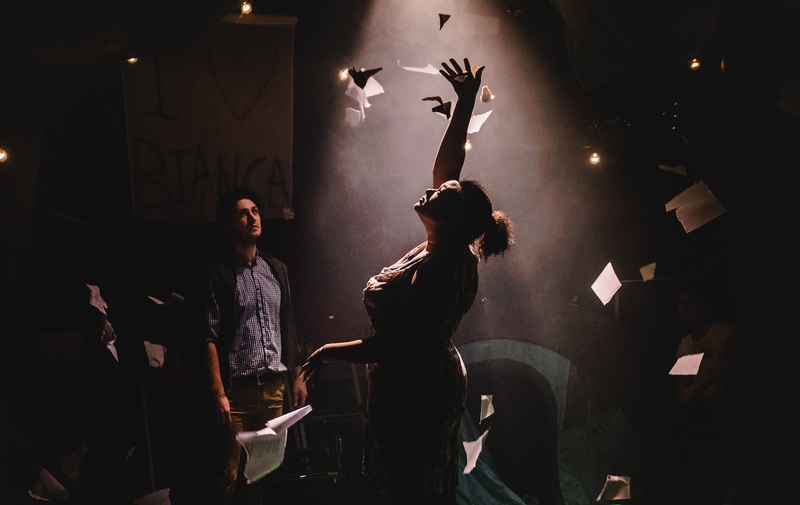 The play’s second thread, the wooing and plotting for Bianca, is, as always, overly convoluted, silly and here – in an abridged version being performed in a small space – a trifle chaotic. Poor CJ de Mooi is asked to grossly overact as elderly suitor Gremio, Samuel Lane to underact as rival Lucentio and Shiv Rabheru to win everyone’s hearts as the utterly romantic Hortensio. The production uses modern music throughout (one song so irritates Kate that she takes radical action to bring the production to a halt) and the summery staging at least goes some way to assuring that The Taming of the Shrew doesn’t have to be the problem many think it is. Running at the Brockley Jack Theatre until August 5. 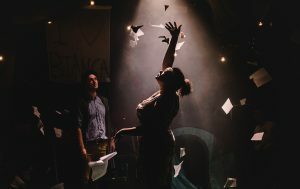 Shakespeare’s problem play, The Taming of the Shrew, is given a radical new look, a different emphasis and features a welcome, unexpected, act of rebellion by Lazarus Theatre at London’s Brockley Jack Theatre.